Since making their debut at The G1 Specials in San Francisco, The Bullet Club's new sub-group, The Firing Squad has been making all the news headlines for all sorts of controversial reasons in NJPW. 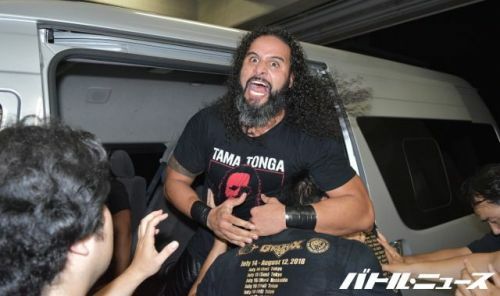 And despite mostly being a Tongan exclusive faction so far, The Firing Squad's Tama Tonga has apparently been looking to add a new member to the faction's ranks. At this year's G1 Special in the US, Bullet Club’s Kenny Omega successfully defended the IWGP Heavyweight Championship against ‘The American Nightmare’ Cody Rhodes in what was one of the most hard-hitting and gruesome singles matches of this year. However, after Omega’s triumphant title defence against Cody, the younger Rhodes brother along with The Young Bucks—collectively known as The Elite—were brutally attacked by fellow Bullet Club members Tama Tonga, Tanga Loa, and the legendary Haku. Shortly afterward, fellow Bullet Club members such as the likes of Hangman Page, Marty Scurll, Chase Owens, and Yujiro Takahashi also suffered a similar beating, as every single Bullet Club member was laid out in the ring thanks to the newly formed Tongan trio known as The Firing Squad. Throughout the recently concluded G1 Climax Tournament, the trio of Tama Tonga, Tanga Loa, and Bad Luck Fale have run roughshod throughout the entire NJPW roster, as the three men went on to intervene and ruin almost every single match from both the A Block and the B Block. As noted, during the recent G1 Finals, The Firing Squad added top Junior Heavyweight Taiji Ishimori to their ranks and as stated by Tama Tonga on Twitter, the notorious group has now targeted a WWE Hall of Famer to join the faction's ranks. Tama Tonga, alongside his brother Tanga Loa and their father Haku, recently posted a picture of themselves on Twitter standing alongside former WWE Universal Champion and Hall of Famer, Goldberg. Tama, in particular, posted on social media potentially teasing a Firing Squad alliance with Goldberg, as he tweeted out "New Member?" along with the picture. The Firing Squad will be looking to make a huge impact once again as NJPW is now looking to kick-start their Destruction tour. Meanwhile, The Guerillas of Destiny will also be challenging The Young Bucks for the IWGP Heavyweight Championship at NJPW's next show in the US, Fighting Spirit Unleashed. Will Goldberg make the jump to NJPW for one more run in a wrestling company? Leave your thoughts in the comments below!